Needle is an open source, modular framework to streamline the process of conducting security assessments of iOS apps. Assessing the security of an iOS application typically requires a plethora of tools, each developed for a specific need and all with different modes of operation and syntax. The Android ecosystem has tools like ” drozer ” that have solved this problem and aim to be a ‘one stop shop’ for the majority of use cases, however iOS does not have an equivalent. 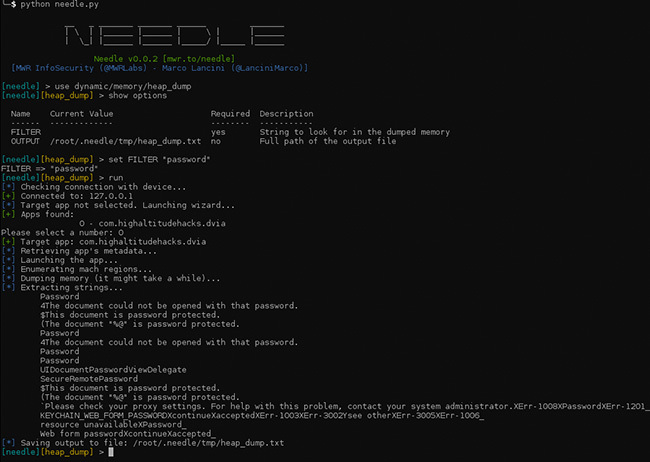 Needle is open source software, maintained by MWR InfoSecurity . See the Installation Guide in the project Wiki for details. Usage instructions (for both standard users and contributors) can be found in the project Wiki .